Feel free to scroll down to see our classes, which are arranged by age, followed by descriptions of our programs. Once you determine the class that is right for your budding athlete, set up an account via our Parent Portal. Need to report an absence or check our calendar for upcoming events, open gyms, and fundraisers? Want to know how to use the Parent Portal, or to request a donation or scholarship? Dynamite offers a variety of class programs to provide multiple avenues to grow and thrive. Our preschool program combines gymnastics with developmental movement, although at 3 years old, gymnasts can specialize in TNT. At the age of 5, students choose whether to specialize in Artistic gymnastics, TNT, or GymFusion. At 10, girls may join Tumbling for Cheer & Dance. An up-and-coming gymnastics sport. Students develop skills on trampoline, double-mini trampoline, and rod floor (power tumbling strip). Artistic gymnastics meets Trampoline & Tumbling. Students have the unique opportunity to learn skills on equipment for both sports. Perfect for kids who prefer a little of everything or want to figure out what they like. Think Simone Biles. 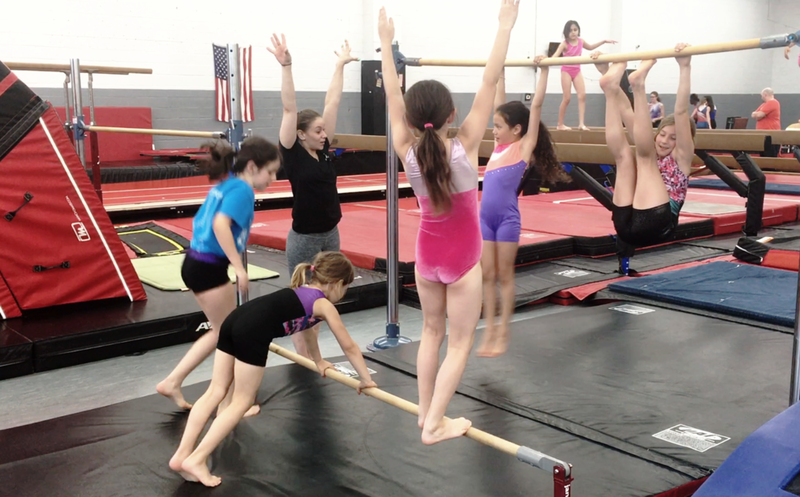 Students develop skills on bars, beam, vault and the spring floor. Focus on proper progressions in a fun and encouraging way. Obstacle courses comprised of bars, beams, blocks and springboards to develop fundamental gymnastics skills. Students learn Artistic tumbling elements (primarily on the rod floor and spring floor) that are easily translatable to surfaces found in cheerleading and dance. Want to get better faster? 50% off additional classes for the same student. Miss a class? Unlimited make-ups as long as the student remains enrolled. Not sure about classes yet? Want to try it out first or get some private instruction to get a head start? We welcome athletes of all ages to try out as many classes as they would like to find the best fit. We have a myriad of instructors (with different personalities and teaching styles) and classes, so take your time finding the perfect match! Looking for one-on-one development? We offer private lessons too! Be aware that your child is taking up a spot that another child could have, so refunds are not granted. Phone calls to the gym are NOT accepted as proof of unenrollment. If you need assistance setting your end date, please send an email to hello@dynamitegc.com at least 48 hours prior to the end date you are requesting and include END DATE REQUEST in the subject field. If you send an email request at least 48 hours prior and we do not set your end date, we will happily provide a refund for any erroneous charges incurred. Similar to ongoing classes, trials and drop-ins can be set up online via the Parent Portal. Requests for trials and drop-ins must be approved as we do not run classes in which no other students are enrolled or when we know students will not be attending that day. Please be sure you receive an email confirmation before you show up. If you have questions about your request, please call 301.770.2700. After you set up the class, please contact the gym to process your payment to complete the registration. If you need to cancel the trial or drop-in, please email hello@dynamitegc.com at least 48 hours prior to the class. Phone calls will not be accepted. Trials and drop-ins take up spots in classes and the likelihood of filling that spot diminishes with time. Dynamite does NOT provide refunds for trials or makeups cancelled within 48 hours of class. In emergency situations and on a case-by-case basis, we may reschedule your trial or provide a credit. At Dynamite, we offer unlimited make-ups, so long as the student remains enrolled. All we ask is that you let us know so we can free up that spot for other make-ups, and don't forget that no-shows or cancellations within 48 hours of the scheduled make-up (for classes, camp, or events) are counted as attended.